Aliter Dulcia is really, basically, the "French Toast" that most of us are familiar with but, this version is egg and dairy-free! Who doesn’t like a nice big plate of French Toast? It brings back fond childhood memories of Saturday mornings, when no one seemed to be in a hurry to change out of their pj’s to go anywhere or do anything. 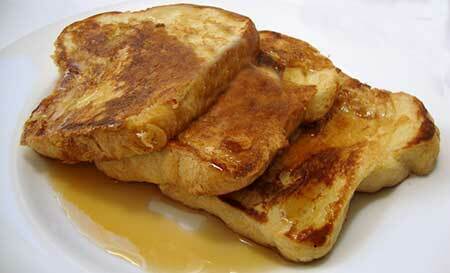 Truly, French toast is the quintessential breakfast food, but many of us will eat it for any meal, if given a chance. This version however, is drizzled with honey. And, did you know that this delectable dish that we call "French Toast" has been around for well over a thousand years? And it wasn’t always breakfast fare, in fact, it likely started out as a dessert. The earliest documented recipe for French toast can be found in the Apicius. Original recipe: Siligineos rasos frangis, et buccellas maiores facies. In lacte infundis, frigis [et] in oleo, mel superfundis et inferes. Translation: Strip the crusts from wheaten loaves and break the loaves into large pieces. Soak them in milk and fry in olive oil. Pour honey over them and serve. Remove the crusts from the bread and slice the remainder of the bread. Dip in milk and sauté in olive oil or butter. Sprinkle honey on top and serve.